Product prices and availability are accurate as of 2019-04-23 17:53:42 UTC and are subject to change. Any price and availability information displayed on http://www.amazon.com/ at the time of purchase will apply to the purchase of this product. - Comes with a versatile design and color to match your home's interiors. - Made of high quality plastic that is sturdy and durable. 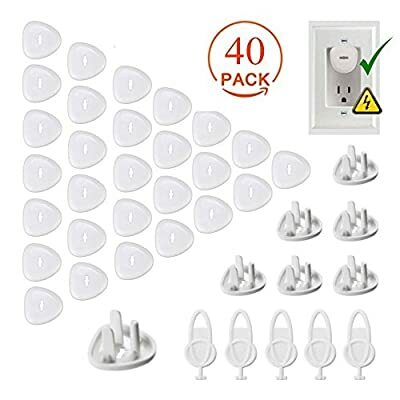 - Offers total cover up for your electrical outlets. - Great for child-proofing any part of your home. - Seals tight to prevent kids from removing these once firmly set up. Have the peace of mind that your kids are completely safe inside your home by using these child safety outlet covers. PROTECTS YOUR BABY! Power outlets are a dangerous hazard in every home for little children. Our outlet plates make it near impossible for a little child to play with electricity, keeping your kid safe. EASY TO INSTALL! With a standard size that fits most average outlets and easy installation, you will have your power outlet plate in place within minutes. You will also be able to remove them easily when baby grows up. EXTRA SAFE SLIDING DESIGN! You can still use your outlets by sliding the plate and plugging your devices in. Babies on the other hand can't use them, so you don't have to worry about accidents. CLOSES AUTOMATICALLY! The sliding mechanism always closes automatically, so you can't forget it open and your kid is always protected by default. 100% SATISFACTION GUARANTEE! Take advantage of our risk free, special price offer now and rest easy that your kid is safe in your home.